To get started, type the name of any school into the College Search box on the College Board’s home page. You will have access to a variety of statistics on the institution. Once you’ve called up a school’s profile, click on the Cost & Financial Aid link to find financial aid stats. 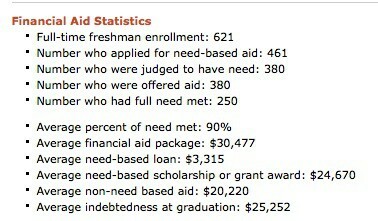 When I clicked on the school’s Cost & Financial Aid link, the first thing I saw was the liberal arts college’s prices. Scary huh? Remember though that the prices are usually meaningless. Most families won’t pay the full tab. It’s hard to decide whether DePauw University is a generous school in a vacuum. Compared to Ivy League schools, which meet 100% of every student’s demonstrated financial need, Depauw is not as generous. On average DePauw meets 86% of a student’s financial aid need. This is not a fare comparison, however, since only the richest and most elite schools offer such amazing financial aid practices. As you can see, Wooster meets a higher percentage of the typical freshmen’s need (90%) It also meets the full need of more freshmen – 250 out of 380 students, who required financial aid. 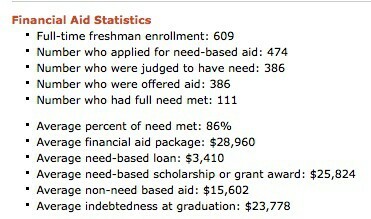 In DePauw’s case, the school met the full financial need of 133 of the 408 freshmen who received financial aid. It’s important to look at the size of the average financial aid package. In DePauw’s case it’s $29,279. Obviously you want packages that contain grants, which don’t have to be paid back. The average need-based grant of $25,918 represents a high percentage of the typical aid package, which is good. Wealthy families, who aren’t going to qualify for need-based aid, must look at the average non-need based aid line, which is higher-ed jargon for merit aid for rich students. The average merit aid at DePauw is $17,134, which is high. The merit award for wealthy students is even higher at Wooster — $20,220. DePauw didn’t share the average student’s indebtedness at graduation, which is irritating and always raises questions for me about why they are withholding that figure. The typical student, who borrows at Wooster, left with $25,252 in loans, which is pretty much the national average for all schools. The average non-need based award is a great place to start to see IF a school awards merit money. But this number by itself can be very misleading at a few schools. Take Scripps College, for example. The Collegeboard entry indicates a hefty average non-need award but a check of the Scripps Common Data Set H2A shows, that in fact, only 13 students WITHOUT need received merit money. Yes you are right. It’s best to check the Common Data Set to see just how many rich kids got merit awards. Another source of this information for individual schools is COLLEGEdata.com.